It is wish of everyone to fully understand the life expectancy of the LED lighting products. Here is all that concerns life expectancy of these products. To start with, everything has a certain life expectancy as to when it should start changing or even disappear. The early LED flashlights had a short lifespan unlike the modern ones. Nowadays, the current LED products are used for both indoor and outdoor lighting purposes. Service is very important to the LED street lights as they are used for long. Generally, LED life is usually characterized by its light and power supply. How to predict the lifespan of LED devices? One needs to understand about the LED lumens depreciation. Most of the while LEDs are received by blue LED light yellow phosphor. The LED light failure can be caused by 2 main reasons. One of them is the blue LEDs light. 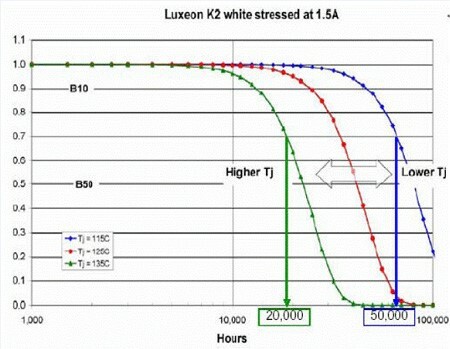 Phosphor decay occurs at high temperatures and lumens depreciation may also occur due to fluorescent. There are various brands of the LED light products. Manufacturers of these products normally give one set of light attenuation curve. Here are the LED source attenuation curve pictures of CREE and Lumiled. 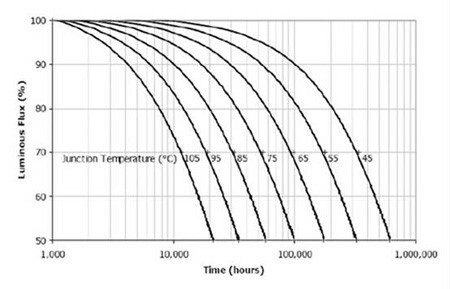 LED light failure is highly associated with its junction temperature. Junction temperature is the temperature of the PN junction and if it is higher, then there is short lifespan. The key to a long lifespan is simply to reduce the junction temperature. If the junction temperature is increased from 115 to 135 degrees, then this will reduce the lifespan of your product which is 50,000 hours to about 20,000 hours. Please click this page to know more about what determine the lifespan of LED Luminaires. How to extend the lifespan of LED lights products? From the information above, the key to prolong the life of these products would be to reduce the junction temperature. Lower junction temperature is very essential to a good heat sink, the heat generated LED out in a timely manner. You will need to know the junction heat problems to be able to measure the reach of radiator temperature. Open Wen Lai speculated that the life should be a bit simple. You can just check the light attenuation curve to see and know what corresponds to 95 at the junction temperature. The life at this can be 20,000 hours. However, this way for the indoor LED lamps have a certain degree of credibility. If it is applied to the outdoor LED lighting more so in light power LED street lamp, there are many uncertainties. The LED street lamps are among the greatest problems of radiator and therefore cooling efficiency decreases as time goes by. This is due to accumulation of dust as well as bird droppings that reduce the cooling efficiency. Due to the fact that in outdoor there are strong ultraviolet rays, the lifespan of LED products is reduced. Ultraviolet is basically on encapsulating epoxy resins that play a crucial role when it comes to aging. If you use it, you can improve the lifespan of your LED light products. Aging has bad effects of the UV radiation on phosphor. Above is very important information that you should know concerning the lifespan of the LED light devices as well as how you can extend the expectable lifespan. Use it and surely it will work out greatly for your LED devices.